We are offering special discounted pricing on dental procedures from January 18th through February 29th. 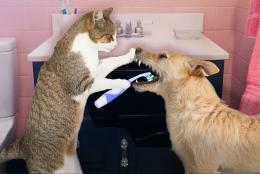 So please do not turn your nose to your pets bad breath! That odor might signify a serious health risk, with the potential to damage not only your pets teeth and gums but its internal organs as well. Call us today to schedule an appointment!